Shopping for Motorcycle Boots | Helmet or Heels: I'm comfortable in either! I’m looking to replace the riding boots I’ve been wearing before next season. 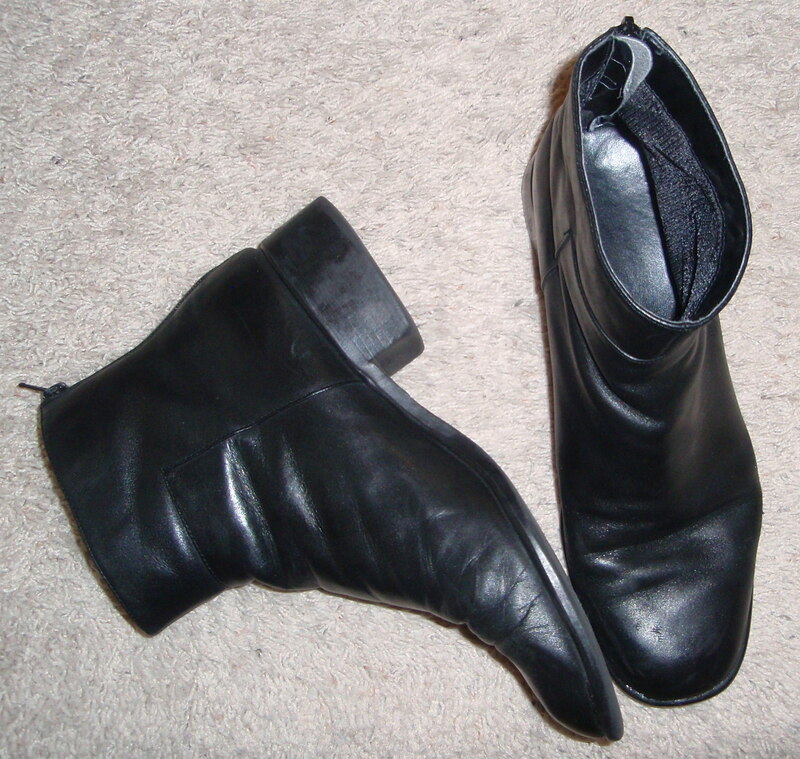 Truth be told they are a pair of leather over-the-ankle boot with an inch heel not a true motorcycle boot. >Gasp< They offered protection for this newbie who hadn’t been on an interstate until this season. Which brings me to believe I need new boots. Not to mention I’ve worn the sole out leaving me without traction. They have served me well, but time to upgrade! I’ve been on a few sites but not sure what I should get or why. Friends, I’m asking for your recommendations. What motorcycle boots should this novice be looking at? One of the problems I have had is that I have big feet and a normal width. I wear a 10 1/2 – 11 in women’s shoes. TMI? Can you help a gal out? This entry was posted in Heels and tagged ATGATT, clothing, Female Motorcyclist, first motorcycle, Motorcycle Boots, Motorcycle Safety Foundation, riding, women. Bookmark the permalink. I suggest you look for “oil and slip-resistant” boots. A google search should bring up a variety to choose from. and couldn’t be happier — very flexible and comfortable, yet all the protection you could want. Cool in the hot weather yet warm enough in the cold weather. Plus they fit my feet, and I have difficult-to-fit feet. Revzilla has tons of offerings and many user reviews and video guides. webBikeWorld is always a great source of info, too. I’m a big fan of Sidi boots. I just got a pair of Sidi Adventure Rain boots and LOVE them. They’re my first full-height boot. Much more comfortable than my too-short Alpinestars Tech 2’s (which are also of questionable quality). The Sidis are worth every penny. The key is you want a boot as tall as you can stand on a daily basis, that closes securely and supports your foot and leg. If you go down, these boots can save you from a broken leg, or from a compound fracture. You don’t necessarily need majorly armored boots for street riding; just a nice, decent height. Take a look at the Sidi Tour Rain Boots and see what you think. I wear TourMaster Solution 2.0 WP ladies boots. They are a touring boot, not too expensive yet offer good protection. They have served me well so far and I really like them. I’ve even waded in the ocean and my feet didn’t get wet. I guess I need to do a review on them one of these days. I wear a 7.5-8 and I ordered the 8 online and they fit fine. If my socks are too thing they are a little loose but not bad, i just wear thicker socks. One good thing about ordering from Revzilla is they have one free exchange so if you do get the wrong size you can do an exchange. I ordered my Rev’it jacket from them a few years ago too. If you are lucky you have a place locally you can try on boots. Around these parts no one carries ladies riding boots unless you want a typical cruiser style with no armor in them. Good luck with your decision making. And let us know how it goes. I’m another Sidi fan. My 10.5 women’s shoe size translates to 43 in Sidi. The women’s styles are narrow enough for my foot, which is average to narrow in width. Oh my! Thank you for all the recommendations and wisdom on what to look for. Anything else I should be aware of or look? I have a shagged pair of Sidi vertigo rain boots which I replaced with Sidi Adventure Goretex boots and I also use Sidi Crossfires for dirt. I had a pair of Sidi Vertebrae and 2 other pairs of Alpinestars (SMX & GP Pro) boots prior to what I have now. I have found that the Sidi’s suit me best. The quality of their boots especially in the adv/dirt models is very nice. The metal cam buckle system is great. On the road boots like the Vertigos that I just replaced, I ended up pretty much walking the soles off after about 4 years. The rest of the boot, survived fine. Many sporty Sidi models have replaceable sliders and bits on them. The Vertigo Rain gave up their “waterproofness” about 3 years into ownership. I never did respray or retreat them, but I’m sure that would have helped. My daughter just got a pair of Sidi Vertigo Lei boots. I wear a US 8.5 and buy a 40 in Sidi. Revzilla is my go to online retailer. Excellent service, good selection. Love them. Take your time and buy what you REALLY want so you don’t buy twice. My personal opinion on boots is that they are something you don’t want to go “cheap” on. YMMV. Dan and I both have the same pair of Harley (gasp!) boots. They’re 2 years old now. I’m guessing mine have ridden 20,000 miles. They don’t feel heavy, are comfortable to walk around in, and are waterproof. At the time they were $150 and very much worth every penny! I wear Triumph Tritex boots – love them! Good warranty too! Check out a Triumph store. I bought my daughter Exustar waterproof boots, she is a size 10 with a wide foot, so she bought a men’s boot and it fits perfectly. They were awesome and very reasonably priced. Consider getting a men’s boot. I heard the best riding boots today are those made from Gore-Tex material/fabric? I still don’t see one. I’m using old boots. My new favorites are the Chippewa Rally boots, padded shin, 1.5″ heel, and still hand made in the US! Not cheap, but they will last a lifetime. You can check them out here. Thank you! Thank you! Thank you! To all of you who have left me such great advice and resources! I’ll be checking all the boots out and will let you know what I buy. Y’all rock!! Just as an alternative to research, I wear an Alpinstar boot. On my second pair similar to http://www.revzilla.com/product/alpinestars-web-gore-tex-boots. They are comfortable, though I have added Dr. Scholls gel heel inserts. Also been through many, many rains and have been very bone dry. I am a total Daytona Ladystar fan. They make my foot and lower leg feel cradled and protected while giving me some extra height 🙂 They are so easy to get on and off with zippers on two sides. They are definitely pricey but worth every penny for me. I have a couple of pairs because I ride every day and sometimes need them re- soled. I highly recommend them but you should try on a pair to make sure you like them! Like Fuzzy and some others recommend, Sidi makes great boots. They’re expensive, though. I have two bikes for which I wear different boots. The Sidis are good for my sportbike since I want superior protection for the greater risk I face. For my touring bike which I ride more conservatively, I wear cheaper street boots (TourMaster) which are comfortable to walk in. Select a pair that suit your particular needs. Keep those comments coming! Looks like I’m going to have some homework to do!! Thank you all for sharing! These are my favorite boots so far. I’ve been wearing them about 3 years now and I noticed their price has come down so will buy another pair soon. I like Leatherup.com because they have lots of choices for women. I tried a pair of from Leatherup, but my feet are too big! I was so bummed. If I go with them I’ll need to order a pair of men’s boots. Thanks for the info. I haven’t found any yet. I have big feet most companies stop at size 10 women’s and I’m thinking I’ll need an 11. I also wear a lot of Harley-Davidson boots. They are great for comfort and function, but many do not want the brand. Hope this helps. Is it too late to answer? I just recently bought the Stylmartin (a european brand) Zeudi Laces boot since I wanted a tall boot that didnt look like orthopedic shoes (My other boots got a “those look…. purposeful” comment). The only thing is they are kind of difficult to get in the US.